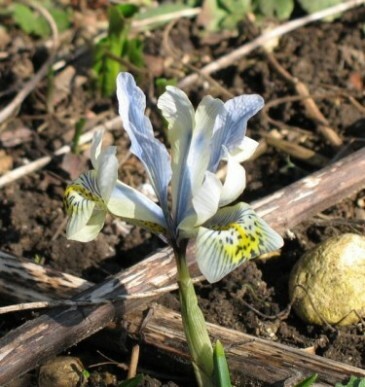 I have seen an iris I planted several years ago flower for the first time – it’s beautiful and although pale and patterned contrasts with the dead plant matter like a lotus growing out of the mud. It’s called Iris reticulata ‘Katharine Hodgkin’. The first year it put up two narrow leaves. Then the bed was dug and I thought I’d lost it – nothing the next 2 years. And now this! Something that survived the snows. I have just found it why it survived watching Carol Klein on Gardener’s World – it doesn’t need the baking in the summer that most iris reticulatas need. Maybe if you have a raised bed you should move it there for you to enjoy all the more?